Woohoo, you’re here! Let’s start planning! For today, all I want you to do is choose a time of year that you want to visit Yellowstone. A visit to Yellowstone during the winter can be both enchanting and challenging…but anyone who has been to this snow-covered wonderland will tell you it is well worth the effort! So, what’s so great about Yellowstone in winter? You can take a snowmobile or snowcoach tour into the interior of the park to see something that many people never get to see…Old Faithful in the snow. The Old Faithful Snow Lodge is open so that you can stay for a few days and explore the many geysers in the area! 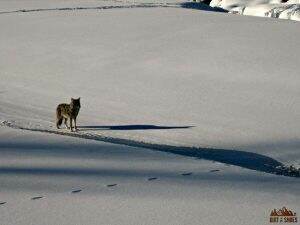 Another big reason to visit Yellowstone during the winter — WOLVES! Wintertime in the Lamar Valley is one of the best times of year to see wildlife, specifically the elusive wolves that roam the area. The snow scares away most travelers, so winter is a fantastic time of year to visit the park if you don’t want to fight through the crowds! Winter temperatures in Yellowstone rarely make it above freezing so be sure to pack your warmest winter clothes. Most facilities within the park are closed, except for a few dining and lodging options at Mammoth Hot Springs and Old Faithful. The park also maintains several “warming huts” along popular winter travel routes. The only road that is open to vehicle traffic within the park is the road that connects Gardiner (North Entrance) to Cooke City (Northeast Entrance). Otherwise, traveling through the park must be done via snowcoach, snowmobile, skiing, or snowshoeing! Oversnow travel is available from mid-December through mid-March, and many guided tours are available! If you’d like to explore Yellowstone on a self-guided basis, a lottery opens up in September for permits. More information for planning a winter trip in Yellowstone can be found here. Just like with the wildlife, Yellowstone begins to emerge from hibernation in the spring and the promise of a new year creates excitement in the air! In my opinion, springtime in Yellowstone is truly fabulous….the middle to the end of May is one of my very favorite times to be in the park. A few highlights you can expect during a spring visit include roaring waterfalls, cute baby animals, and extra steamy geysers! Crowding within the park is moderate, but definitely manageable during this time of the year (except for Memorial Day weekend). A trip during April is not advised, and even into early May, as most in-park lodging, dining, and roads don’t open up until mid-May. Click here to see opening dates within the park. Spring weather in Yellowstone is completely unpredictable. Be prepared for every kind of weather — rain, snow, hail, sun, wind, biting cold, etc. You’ll need a big selection of gear! The popular trails/boardwalks will likely be mostly clear of snow, but many backcountry trails may still be covered in snow or very soggy. If you’ve got your heart set on backpacking, waiting a few more months will likely yield a better outcome. 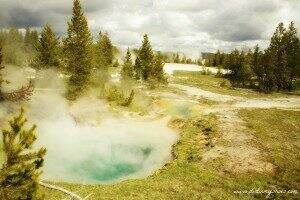 The great thing about Yellowstone during the summer is that everything is open! You’ll have numerous lodging and dining options, plus access to all of the main points of interest, tours, programs, and visitor centers. Your options are endless during the summer, but that comes with a price….crowds. Be prepared to share the amazing sights of Yellowstone with people from all over the world during the popular summer season. To better avoid the crowds and traffic jams common to Yellowstone during the summer, you’ll definitely want to have a solid plan, like this detailed itinerary! Having a plan will minimize wasted time and make your trip much more enjoyable. Summer is wildfire season in Yellowstone. You may find air to be smoky from nearby fires, areas may be closed, or fire restrictions may be in place. Numerous activities such as horseback riding, boating, and biking are all available during the summer months. You can check out some of your options here. A quiet solitude begins to fall over the Yellowstone landscape as the busy summer crowds start to die off. A chill fills the air as the animals and plants begin to prepare for winter…and it’s absolutely magical! Autumn in Yellowstone is fabulous, especially after Labor Day weekend. A few highlights of a trip during this season include fall colors, bugling elk, fantastic wildlife watching, and more elbow room to enjoy the sights. 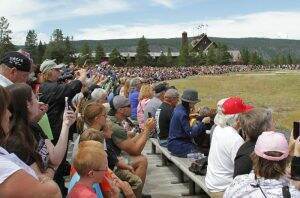 While September still sees a fair amount of crowds, it is still substantially less than during the summer months. A visit in October will yield even fewer crowds. I would skip a visit in November because almost everything is inaccessible by then. Most lodges, campgrounds, and restaurants within the park are closed for the season by the beginning of October. Click here to see closing dates within the park. Autumn weather in Yellowstone is completely unpredictable. Be prepared for every kind of weather — rain, snow, hail, sun, wind, biting cold, etc. You’ll need a big selection of gear! All roads in the park (except for the road from Gardiner to Cooke City) close by the beginning of November. Even though snow may fall during your Autumn trip, many backcountry trails are snow-free and still accessible in September and October. Well, there you have it! I know….it’s a lot of information about the seasons of Yellowstone. But now you’re ready to make a decision. Let’s complete Step One. 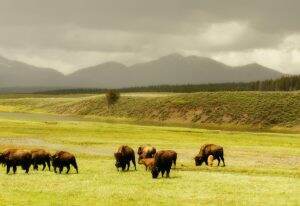 Decide today what season is going to be best for your trip to Yellowstone and write it down! You’ll want to have the decision made before moving on to Step Two tomorrow. Talk to you then! 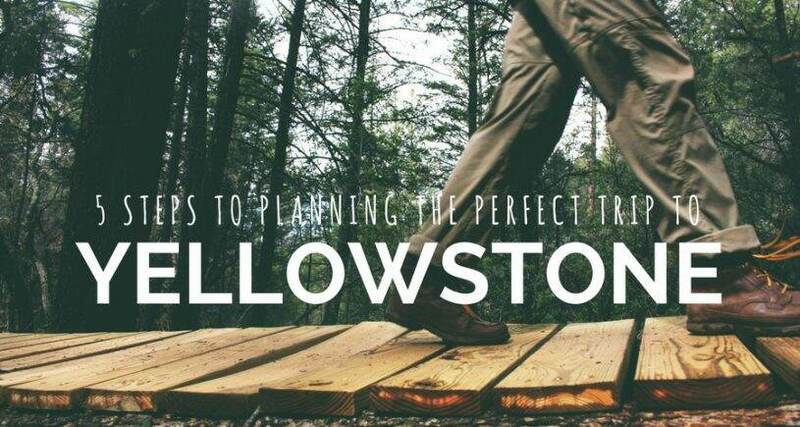 This is Step 1 of planning the perfect trip to Yellowstone. To read the other steps of this series, sign up here.